Windows 10 has and continues to grab a huge deal of attention, generating a growing media interest, particularly since this is a vital operating system to get right for Redmond given the (relative) failure of Windows 8 (and RT) and the timid reception for Windows 8.1. However, let's not forget that Microsoft has another major cash cow, Office, which has been gradually transformed from a Windows-centric productivity suite of five core products into a vibrant ecosystem of applications, many of them web-based (welcome to the world of SaaS). In Microsoft's own words, this time around, the company has reimagined the traditional Office experience for a mobile-first, cloud-first world – one where a client-centric Office 2016 is expected to play an increasingly lesser role compared to Office 365 and Office 2013. It is the new version of Office, the first one that is designed and built from the ground-up for mobile and cloud. 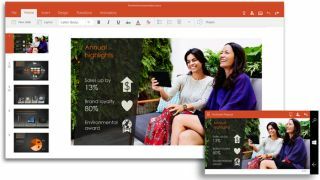 Office 2016 has been launched on September 22.
for a likely "Office Home & Student 2016" edition, though the RRP of the 2013 version of this flavour is £110 (around $165, AU$215), with the subscription version of the suite (Office 365 Personal) running to £60 (or $70, which is around AU$90) per year. It will still be best suited to a PC with a keyboard and mouse, a setup that Microsoft seems to believe is the best way to achieve optimal productivity. Microsoft's Joe Belfiore has previously shown off touch and mobile optimised versions of Word and PowerPoint on Windows 10, both of them on Lumia smartphones and part of a new offering called "Office for Windows 10" (see the above and below video clips). More recently, we got the chance to go hands-on with the Office for Windows 10 apps, which have seen changes in the aesthetics department of course, having been given the new universal app styling you'll be familiar with for Windows 10 apps. And naturally, there's a touch-centric UI that will look familiar to iPad users. In the Word app, for example, there are finger-friendly cursor controls for easy text selection and copy/pasting, plus tapping on a spelling mistake brings up a touch menu of possible replacement words. There's also a new Bing-powered feature for Word called Insights, and this looks up background information, websites and news stories for selected words. Track changes, comments and co-editing are available too, but not every layout tool is present in this Word app. Excel has benefited from a considerable makeover, and additions including snap functions and smart scrolling which make tapping in your spreadsheet data an easier process. It has the same touch-friendly interface, but it's not as stripped down as with Word, and it boasts a status bar that lets you switch between sheets in your workbook and view the results of common formulas for selected cells. PowerPoint has a useful range of editing tools, but the preview version we played with had weaknesses in terms of supported file formats, and the Presenter View not being as useful as we'd hoped (it isn't really full-screen, for starters, with the title bar at the top always being present, and the Windows taskbar eating up display real-estate, too). Overall, at this point the Office for Windows 10 apps look to offer a reasonable selection of features with a nice touch-friendly interface, but that UI takes up too much of the screen in landscape mode. Office for Windows 10 will be released in two flavours; one for smaller 8-inch or less tablets and smartphones, and the other for larger tablets, hybrids with touchscreens and the like. These two versions are built by the same team and offer similar functionality, and are basically a matter of tuning the UI to complement the dimensions of each device. Broadly speaking, the features will also be the same across different platforms too, whether you're running on Android, iOS or Windows. Microsoft has said that Office for Windows will be limited to four apps (Word, Excel, PowerPoint, OneNote), because those are the most essential apps which the company wanted to prioritise, and maximise the quality of. Redmond's Richard Ellis, director for Office in the UK, recently told us: "When the need for other apps is known to us by consumers, we will listen and make plans to develop further apps for Office for Windows." We've reached out to Microsoft to get more clarity on exactly what the deal is with these apps in terms of pricing – it seems licensing fees will apply for business usage, though it's not exactly clear how that will work at this point. Microsoft has, however, just announced that you will require an Office 365 subscription to be able to edit (and not just view) with these touch-friendly apps on Windows 10 desktops and larger tablets. If you have a device sized 10.1-inch or less, viewing and most editing functions (not all of them, though) will be free for non-commercial use. The OneNote app will allow editing for free, though, across all devices (and it will come pre-installed with Windows 10). These apps have just had the "preview" label dropped, as they will be released with Windows 10 at the end of July.